Foursquare Warns Its Competitors: "We're Running Like A Well-Oiled Machine"
That’s what Foursquare co-founder Dennis Crowley had to say when I spoke to him earlier about the service. Crowley is known for being outspoken. But he’s usually not that outspoken. But maybe he has reason to be. I reached out to Crowley to ask him about NBC promoting Foursquare today. As you may have heard, The Today Show promoted a new partnership with the service earlier today (and did so on-air). But NBC itself also appears to be ready to heavily promote the service. This new mysterious “Fan It” site due to launch in 3+ days, implies partnerships with four main players: Facebook, Twitter, MySpace, and yes, Foursquare. That’s quite a crowd that Foursquare has been added to. And they know it. “Foursquare is out of control!,” Crowley says. “I didn’t even know Today Show was happening! We’re running like a well-oiled machine!” It was after this that he made the comment about this summer and the competition. I asked Crowley if that meant the Yahoo deal was off the table now, as Silicon Alley Insider reported yesterday (and we’ve heard as well). “Ha ha. We’re just psyched to be building great product and people seem to love it,” Crowley responded. That’s an enthusiastic “no comment” at least! Crowley also confirmed that Foursquare has 20 employees now. It was just this past October that Foursquare was living up to its name with only four employees. In other words, if they don’t sell, they’re going to need some new VC money soon, having taken only $1.35 million so far. Though some deals are bringing in revenue (but the company is not yet profitable). “We are almost over the hump. Scaling outpaces engineering, engineering outpaces product, product outpaces biz. It’s all starting to come together,” Crowley notes. That certainly doesn’t sound like a man about to sell. Unless, of course, he’s playing me to get me to write that as a negotiating tactic. But when he was thought to be in the midst of negotiating with Yahoo several weeks ago, Crowley was saying almost nothing, so I have to believe he is just generally enthusiastic about the product right now — as all founders should be. Going back to the comment at the top of this post. Clearly, Crowley knows Facebook is about to launch its entry into the check-in space. Yet he’s still bullish on Foursquare’s immediate future. That again signals to me that while Facebook will have its own checking-in method, they’re also going to federate check-ins from other services, like Foursquare. That can help the service with a million users gain a lot of exposure. And Crowley was meeting with Facebook CEO Mark Zuckerberg last week in New York City for some reason. 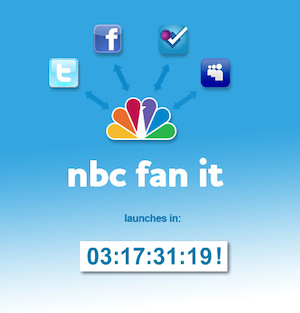 Here is how it will work: starting May 17 users can go to NBC.com/Fanit and log in with the Facebook, Twitter, MySpace, FourSquare or MyNBC accounts. After that, all they have to do is “Like”a show on Facebook, watch a video on NBC.com or talk about a program on the social networking sites, and they will earn points as their friends click through. The points will be redeemable for merchandise an virtual goods (think FourSquare badges) as well as early looks at new and returning shows.